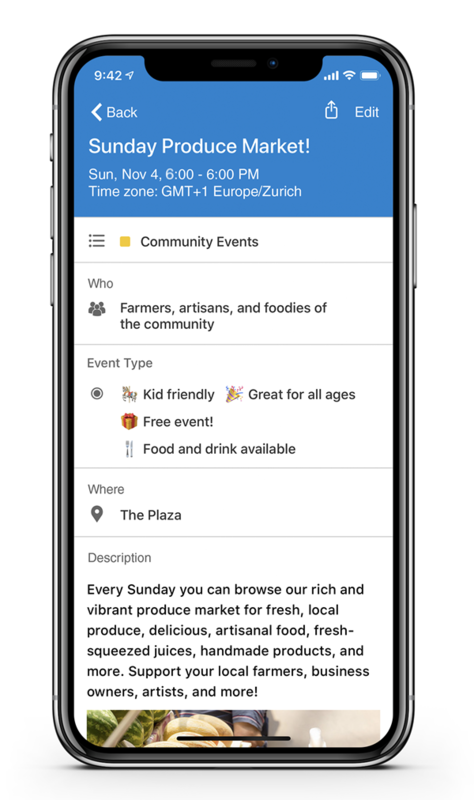 Since the beta introduction of Custom Event Fields, many of our users have made great use of this unique feature that makes Teamup so much more than a conventional calendar. Rename and reorder the built-in fields (Who, Where, Description). Create your own custom fields. Now you have much more control and flexibility to make Teamup work best for your needs. Read more about how to create and configure custom fields in your calendar’s Settings. You’ll need to access the calendar with an administrator link to go to Settings and create or configure the event fields. During the beta period for this feature, custom event fields were not accessible on the Teamup mobile apps. We did a lot of testing and troubleshooting; now, we are excited to share that custom fields are now supported in the latest Android and iOS apps! Shown below is an event that falls into multiple categories in the “Event Type” custom field. An emoji for each category makes it fun and quick to read. The flexibility, customization, and power of custom event fields is yours on-the-go, on any device. We’re excited to hear how our efficient, capable Teamup users take this feature and make it their own. Get started making your own custom event fields.